Many have recently brought to my attention a recent legal hearing regarding one of our affiliates, The Hub Stadium. For those unaware, the Michigan Liquor Control Commission (MLCC) had recently reviewed The Hub Stadium for “health, safety, and welfare concerns”. After the review, there was a hearing which determined the operation to have lax enforcement of safety precautions. This resulted in a hearing on Thursday, August 30. The bar received a brief, one-day suspension on Monday, September 10, “to allow the licensee to make numerous structural and policy changes.” You can read about the case here. The World Axe Throwing League requires a high standard of safety practices and was not aware of the situation until after the hearing. But since becoming aware of the situation, I personally confirmed with The Hub Stadium management to ensure they meet the highest of standards going forward and continue with a fun and safe environment for all the Hub Stadiums patrons and leagues. In addition, it is worthwhile to mention that in my discussions with the management of the Hub Stadium, the allegations against the Hub Stadium were not substantiated or proven by evidence in court with exception to the social media trick shot posts only. Interestingly enough, the unexpected media attention related to the 1-day suspension has resulted in The Hub Stadium’s traffic to increase substantially, which we can say we’re quite happy for as they move forward with these new safety procedures in place! 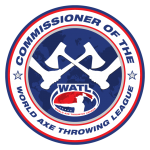 As the popularity of axe throwing continues to grow, it will be subject to continued review by many public organizations which I believe will benefit WATL and all throwers. While we require our affiliates to abide by our global standards for safety, we want to also ensure that our sport is not being dictated by base allegations or presumptions in our industry. Only by working together can we continue to grow the sport of axe throwing in the right direction. If there are ever any questions or concerns with following safety protocol or laws, we at the World Axe Throwing League are always willing to offer a helping hand to make sure all involved have a safe and exciting environment to throw axes. Sincere thanks to everyone involved for being professional and working together to move forward in a positive direction. Also thanks to everyone speaking about it in public forum. The more we can raise awareness of the sport and what we need to make it safe and fun, the more we continue to help it grow! Good work WATL for being involved and supporting affiliates to help the sport and its network of affiliates and throwers! Do we foresee any policies changing because of this?